Science centers provide the perfect combination of an educational atmosphere and an experience you’ll never get bored of. Thankfully, Michigan has plenty of them. From planetariums that explore our galaxy, to aquariums that explore our oceans, and institutes that explore everything else, the Great Lake State wants to help you discover something new about the space we inhabit. Here are our 10 favorite science centers in Michigan. The Air Zoo represents a bit of a contradiction in terms. There's no real “zoo” involved, but rather an exhibition of flight and aircraft in all its forms. There's even an entire section of the building devoted to the highest flight of all: Space travel. Check out exhibits on the science of flight from friction and weightlessness to fluid dynamics, all under one handy roof. When a location can bill itself as “Michigan's Museum of Natural History,” you know you've got something special on your hands. Bloomfield Hills' Cranbrook Institute of Science does just that, and boy, will it deliver. Containing not only an array of hands-on science like touching an actual meteorite—gaining superpowers not guaranteed—but also checking out a planetarium in the Cranbrook Observatory, a biological wonder in the Erb Family Science Garden, and a host of other attractions, Cranbrook will have just about every scientific taste covered here. Head out to Adrian College to check out the Robinson Planetarium and Observatory. Not only is this where the Adrian College students go for astronomy courses, but also, this is where free shows are made available to the public throughout the year. With a 30-foot dome and a Spitz A-3-P star projector on hand, based on reports, this science center will put on quite a show, and teach a few things while it's at it. Head over to Kalamazoo to check out the Kalamazoo Valley Museum. Part of the Kalamazoo Valley Community College, it will provide plenty of exciting contact with science for most anyone. With exhibits and special events running throughout the year—and a recently upgraded planetarium boasting a new sound system and LED lighting—options will abound and even the fussiest of travelers should find some exciting new encounters waiting. Detroit is home to a lot of things, but some may be surprised to note that's it's home to one of Michigan's greatest aquariums, the Belle Isle Aquarium. Part of the Belle Isle Conservancy, the aquarium focuses on not only the wildlife contained within, but also the various issues faced by, the Great Lakes. Featuring a set of exhibits and special programs, the result is a powerful look at the occupants of one of Michigan's greatest natural features. The Longway Planetarium recently had some upgrades to make it even more exciting. Check out the new seats, new dome, new cove lights, and new 7.1 channel surround sound system and projection system to make it a powerhouse presentation center, complete with new programs as well. Got someone in the family who's into dinosaurs? Then we’ve got great news for you, because if you head to Ann Arbor, you'll get to check out the University of Michigan Museum of Natural History. There, you'll have access to plenty of exciting science, including a planetarium, but you'll also get access to a list-topper: The museum houses the single largest collection of dinosaur skeletons in the state. So, from the heavy hitters to the smaller herbivores, come check out dinosaurs in all their bony glory. Getting young children interested in science can be tough, but Ann Arbor's Hands-On Museum teach your kids about the subject—and adults too!—all while making the experience exciting and interactive. Tackle topics like nature, physics, biology, and even a little history with this science center. It's easily one of the biggest and most extensive science centers around, so much so that it's named for the entire state. Featuring a 4-D theater, an IMAX dome, a planetarium, and a host of exhibits, the Michigan Science Center will deliver a little something special for just about every scientific taste on the list. There's even an entire section devoted to construction for the kids, known as Kidstruction, which devotes itself to engineering via vinyl block, planks and more. Did you know the largest aquarium in Michigan is found at a mall? Found at the Great Lakes Crossing Outlets in Auburn Hills, the Sea Life Michigan aquarium is the state's largest. With all that real estate afoot, there's not surprisingly a lot to see and do contained therein. 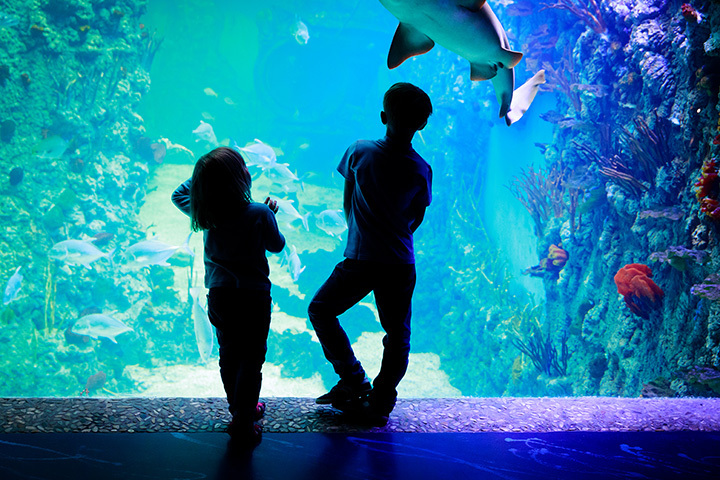 With over 5,000 creatures on hand, including a 180-degree underwater tunnel to witness sharks and stingrays first hand, the sheer amount of aquatic science afoot here must be seen to be believed. View more Michigan Science Centers.